I want to start this post off by thanking all of you for your support! It means more than you know, but most of all, I'm glad you support the community - and every event that occurred this past week. On Saturday, we were able to have our very own Halloween event, the 2nd Annual Halloween Run. This event was different than our past events because it was our very first time streaming a major event! This event started out around 4:00 am in the morning with a few awesome wizards excited for the fun that the day would bring us all. I wasn't planning on logging in so early and staying, but I had to stay and talk to everyone - as I usually do. My main goal for these events is to bring people together to make new friends in the community. I've made many new great friends from these events, and I hope you have as well. So around 11:00 am, we had a slightly confusing Nightmare Before Christmas Run! I was planning on streaming but had technical difficulties. Everyone was patient with me to create a new stream that would begin later in the evening. As we were waiting to stream, everyone in my area was taking group pictures! I was multitasking, but I am glad I was able to get a few pictures, like the one above. It was nice talking to everyone, even though I was extremely busy earlier in the morning. After a long wait, the stream finally began around 1:00 pm CST! Autumn Dreamwalker and I were extremely nervous, but as we got started, that nervousness soon disappeared (well later on it reappeared, but only because of a special interview I had with someone extremely awesome in the community). After our introductions and background of the Halloween Run, we began talking contests and activities! 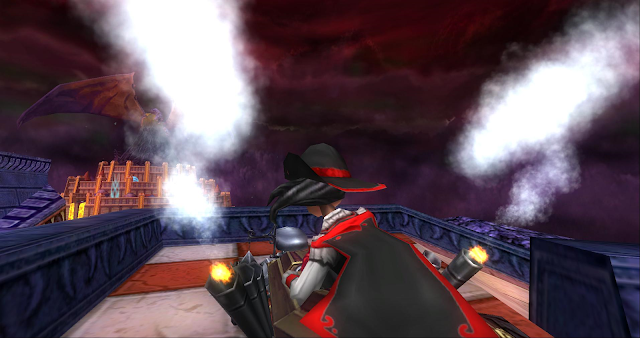 We first went to the Ravenwood Halloween Towers, where we went through each of the three towers. This was a lot of fun and well, Y'all got to see me use many victory heals! After the towers, we had a Lord Nightshade farming activity with Fallon Fireblade. Fallon joined the discord after #FamousAutumn had to take a leave for a bit. I was hoping the entire time I'd win something on the stream, but was unable to do so! Nightshade is rude, but I don't think he liked that high-level wizards were hitting him with strong spells. Maybe that's why he didn't drop anything! It was still a lot of fun! We had many more activities that I won't mention on this post and will just direct you to watch the Stream (video above). The activities were a test and it seems to have gone well, so I'll be including more fun activities for future events. As many of you already know, the Halloween Run was full of contests. I believe prizes were valued well over $600 (including codes that we bought and codes are given to us from our awesome community manager - who also attended for nearly 45 minutes! We know how busy Tom is and this was amazing that he took time out of his day to attend. Thank you, Tom! It really meant a lot to all of us that you attended and also gave us 60 additional codes to giveaway during the stream. His codes + all other codes are given away were most likely the largest contests to take place in this community since the Diary of a Wizard events. We're not bragging, but that's the last time I remember so many prizes being given away to the community. 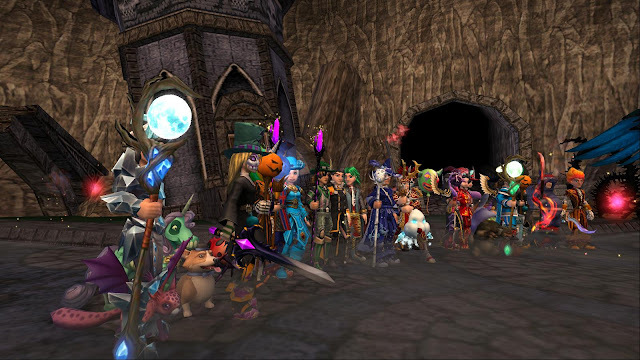 At the time of the Diary of a Wizard events, prizes were garnered up from all fansites and given away to the community - and those were the largest events + amount of prizes to be given away from any fansite or any event. We would never compete with anyone, especially DOAW. Afterall, DOAW is one of the main reasons we have these events in the first place. The Run began at 6:00 pm CST! It was very exciting to have everyone start the run. However, my game crashed many times due to the lag! I don't think I had this issue last year, but it seems more people were allowed into one area than last year. It was great to have so many wizards join us. I loved that we were able to get everyone together once more for the event. It was nice to have everyone to join us for this year's Halloween Run. We will have another one next year! We'll always do this for you, the community. Thank you for your support! I would also like to thank our amazing hosts, moderators and port wizards who helped make this event happen. Without all of you, this would have never happened. Thank you for your hard work to bring this community together once more. I promise we'll have events like this for years, without any competition. Thank you all for reading this year's Halloween Run Recap Post. I wish you all the very best AND safe Halloween! Happy Halloween. I hope you're having a great week. I've been sick, but I'm finally feeling better! 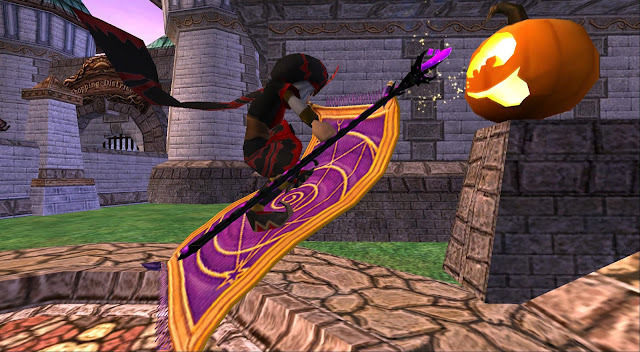 Yesterday I was able to stream Wizard101 again and quest a bit through the test realm with Autumn Dreamwalker. We're streaming a lot more to get used to streaming before the Halloween Run on Saturday! 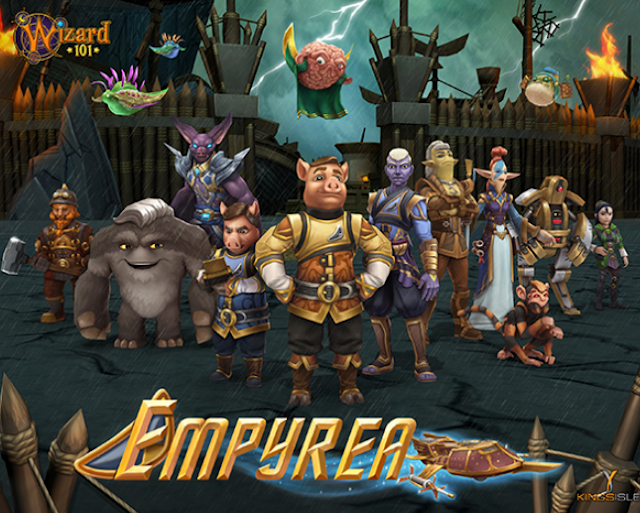 If you would like to watch our test realm adventures, you can click play on the three-hour video below! I hope you're having a wonderful Monday. Today I'm having a sick day, and this is probably the first sick day post I've made on this website in last five years! Today, I wanted to share a special stream that we had on Saturday to show our excitement for the Official Halloween Run on SATURDAY. Please remember this will be a family-friendly event. Now, let's show you what we did during the weekend. Hope to see you all on Saturday at our major Halloween Stream. We officially have ONE MORE WEEK until the Halloween Run. Today, I decided to announce a special stream/party that we'll be having to show our excitement for next week's event. I haven't announced this everywhere, but I hope you're able to attend this fun little party. I hope you're able to show up. Port Wizards are not required to show up since this is not the Official Halloween Run. I am seriously looking forward to seeing everyone and I'm prepared to have a much larger audience in the streams than recent streams. We're still working hard on next Saturday's event. I'm not a professional streamer and will be streaming for fun! 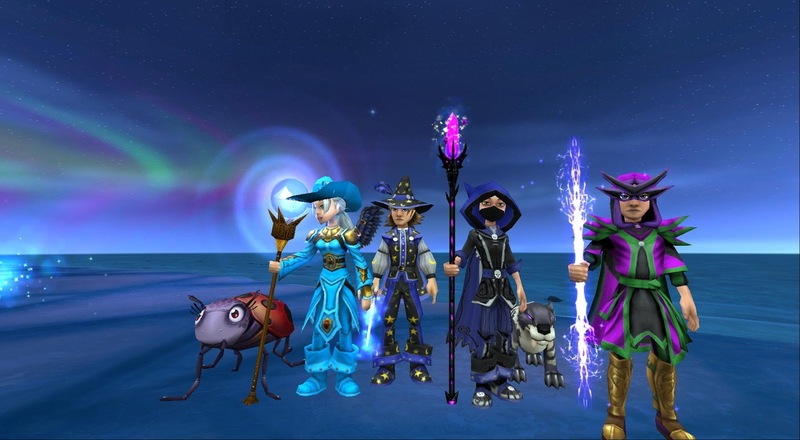 I love the Wizard101 community and want to bring a more family-friendly experience back to the community as it once was when I joined. Plus lots of prizes and activities! So enough about next week, I hope you're able to join the stream tonight. If you have any questions about the Halloween Run, you can join YouTube Chat. Be family-friendly or you will be banned from chat! 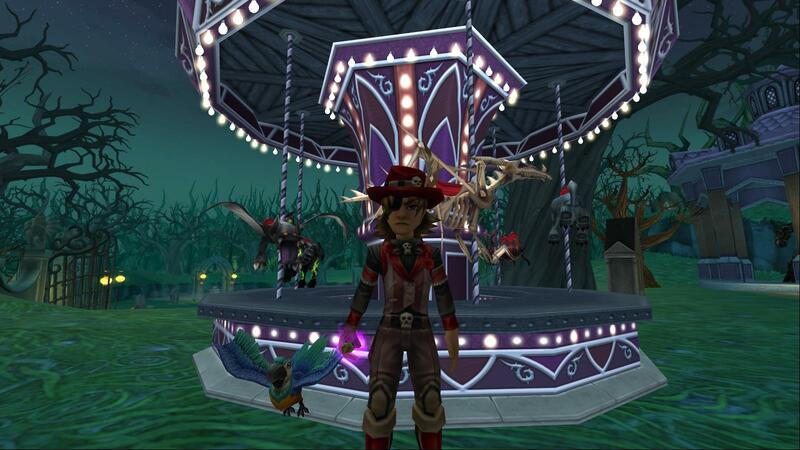 I mean how cool is the Spooky Carnival Bundle?! 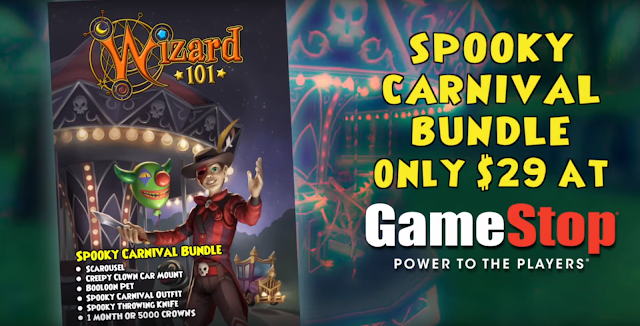 Today, Kingsisle announced a new bundle, the Spooky Carnival Bundle, which can be bought at GameStop for $29. This new bundle comes with a Creepy Clown Mount (4-Person Mount), Booloon Pet, Spooky Carnival Outfit, Spooky Throwing Knife Weapon, and a 1 month W101 Membership OR 5,000 Crowns! This looks like an awesome Bundle and I look forward to giving one away for the Halloween Run! I hope to see many clowns at the event next Saturday (of course it's not required). I can't wait to try this bundle out for myself. If you would like a direct link to the GameStop website, just click anywhere on the image below. You can also check your local Gamestop for this new amazing Bundle! Before I continue, I want you all to know that this is my 100th blog post of the year! I thought I'd save this special moment for today to let you know that I will be streaming Pirate101 for the first time! I'm looking forward to questing with Autumn Dreamwalker. If you would like to watch, you can click on the Play Button on the YouTube video at the listed time below. Hope to see you there! 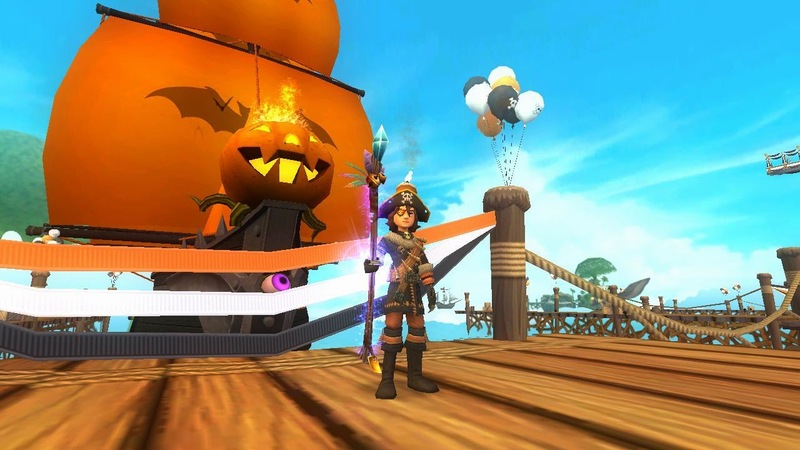 I know it's crazy, but today is actually Pirate101's 5th Birthday! Time is flying by! 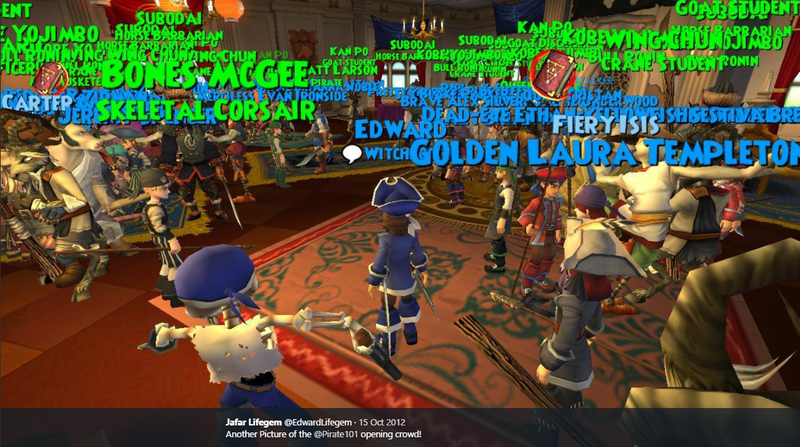 I can't believe it was five years ago when Kingsisle first let pirates venture Skull Island. I remember standing with other Beta Players waiting for everyone to show up as the time neared - as we had a One Week Headstart. It was amazing to see so many people wanting to try out Kingsisle's newest game, at the time! Pirate101 will always hold a special place in my heart! It really brought me closer to the community than I thought it ever would. I love this game and I'm glad Kingsisle is spending more time on it again. I look forward to many more years of Pirate101. If you haven't tried this amazing game out, you should. Some might say, oh it's not Wizard101, and it's not. 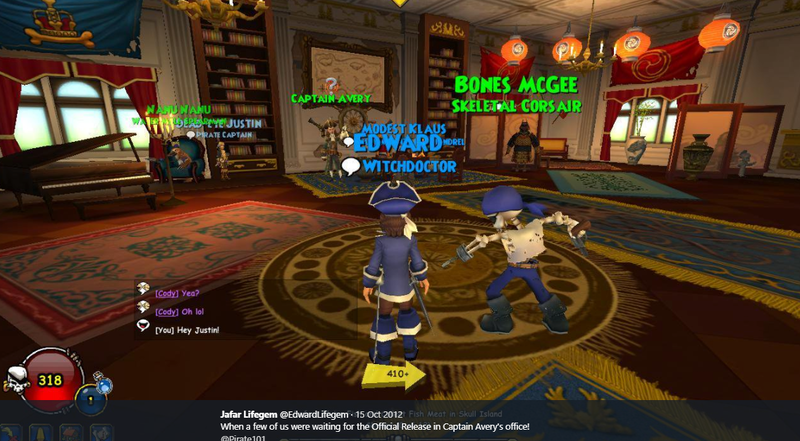 It's Pirate101! Never judge a book by its cover, you might be surprised if you don't. Thank you, Kingsisle, for so many wonderful memories! I wish you a very Happy 5th Birth-O-Ween! Yes, I have another update video for you all. I want to release a few videos before streaming to test this new microphone out. I can't believe I'm doing this, but at the same time, I don't mind. :D Let me know what you think about this microphone now on social media. I will improve as time progresses. The Halloween Run is quickly approaching! We're working hard to make this event a lot of fun! Today I'm proud to announce that we're starting the first of our contests - from one of our amazing hosts, Autumn Dreamwalker. We'll be having a Halloween Run Guide Contest! Keep reading for more information. List Every Area In Order: Watch the Halloween Run Guide Video (above). In order, list every area that we travel to in the Halloween Run Guide. There will be areas that appear two or three times. Please list every area - Example: We start in Nightside and end in the Death Tower. 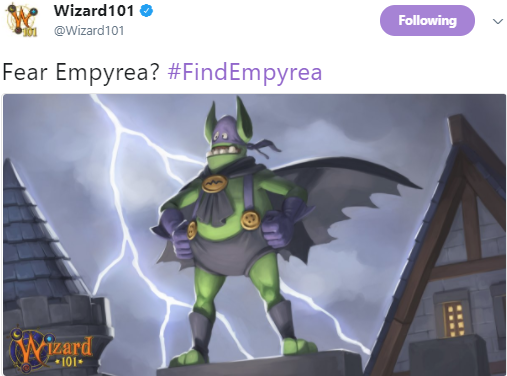 Today, Kingsisle sent out their very first Batman-Gobbler themed Concept Art on Social Media teasing a soon-to-be world, Epyrea. 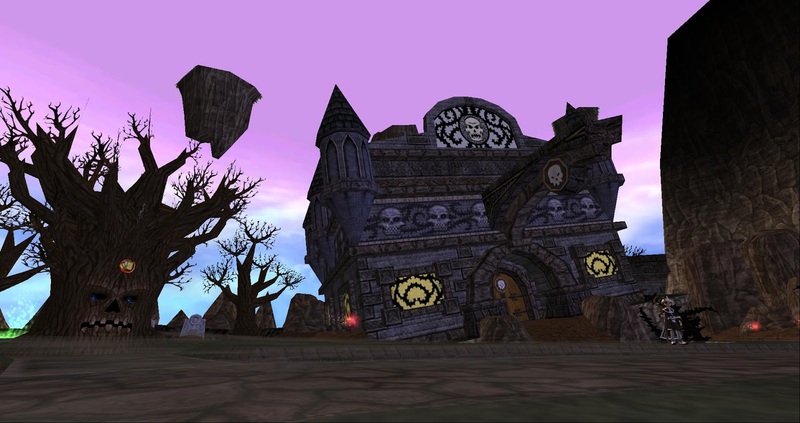 This world is expected to be released in the test realm later this month or early November (guessing obviously). Are you excited? I know I am! As they release new Concept Art throughout the month, I'll be sure to update my website with new posts! 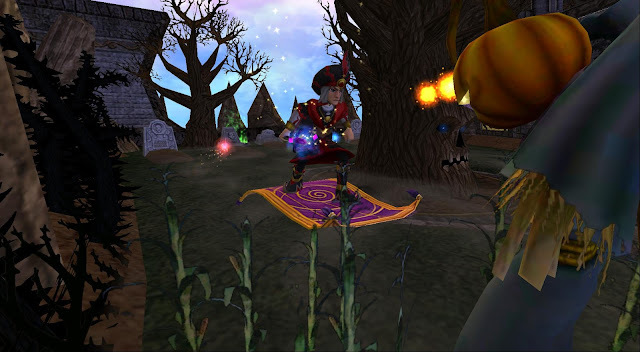 Yesterday, Kingsisle added the Halloween quests back to the game. I've always loved the beginner Halloween Quests because they're so nostalgic. This year marks my 9th Halloween with Wizard101. That means I've quested through these quests for nine different Halloweens. Time sure does fly by! I know we have new quests, but the quests that have been here since the beginning have been my very favorite quests in this game. I'm sure many others feel the same way that I do. As I mentioned above, I quest through these quests nine different times, but they'll never get old. I remember the first time I quested through back in 2009 when I knew this game was the best game ever! Yeah, I still believe that (but we have to add Pirate101 to the list now). These are all equally amazing quests, from the Ghosts to the Pumpkins to the Apple Bobbing. My favorite has always been the Pumpkins, though! 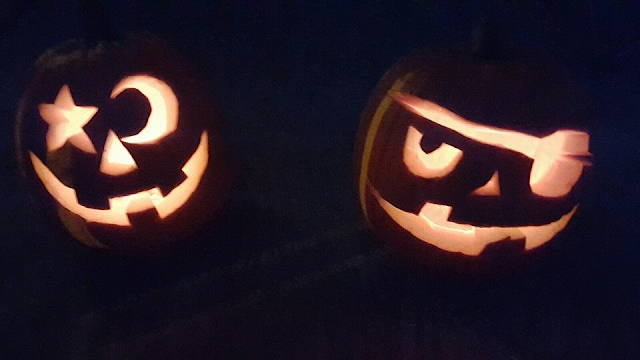 I mean, have you ever listened to the narrator when you trick-or-treat for the pumpkins? It's awesome. Give it a listen! I've actually memorized all of the lines over these past few years! Today many want new things constantly, but for me, these quests along with many other not so new things will have a close place in my heart. Thank you, KI, for so many wonderful memories. Here's to new wonderful memories with the recently added Halloween quests.. which I'll probably quest through, tomorrow evening. Hmmm! 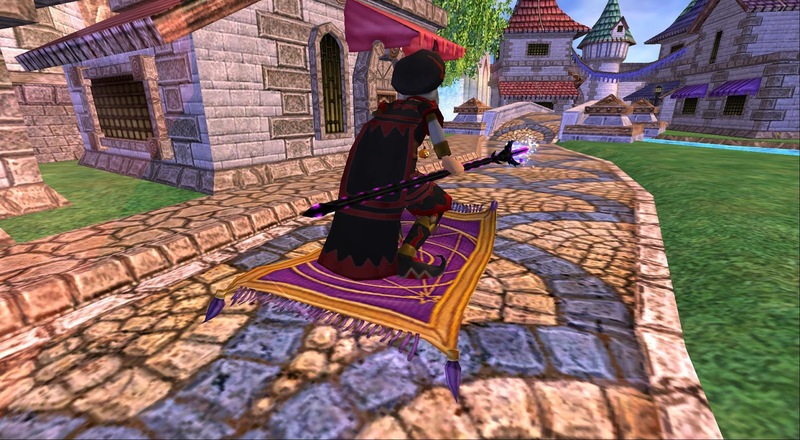 This carpet does not like me... Aladdin, you're ruining my plans to take over Wizard City! I hope you're having a wonderful 2nd Day of October. I still can't believe it's October because it's one step closer to the Holiday season! I also love October because I'm able to make many blog posts and quest in game more since it's a quieter time. 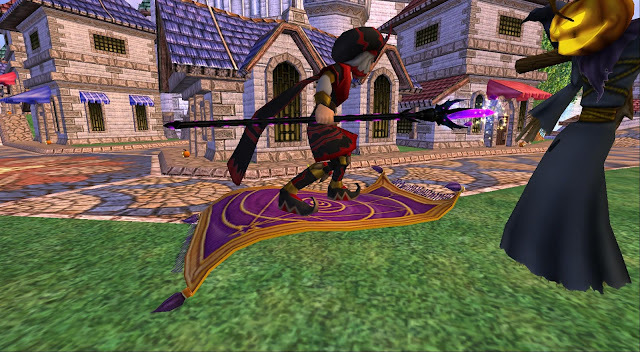 Today, I decided to make a blog post recapping an event that I attended during the weekend from Duelist101. 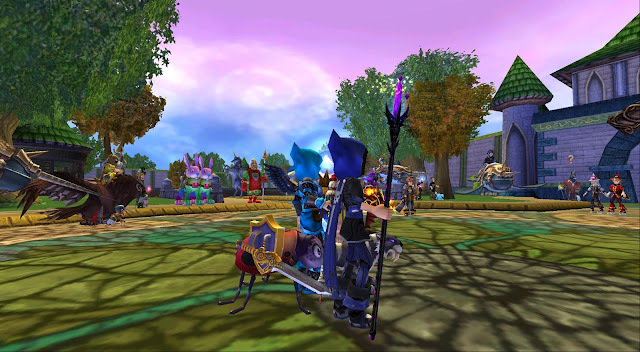 On Saturday, I arrived at least an hour early for the Wizard101 Celebratory Tournaments from Duelist101. Now, many of you already know that I've never participated in a tournament, but I still wanted to attend to show my support for Duelist101 and all of the hard work that they do for the community. 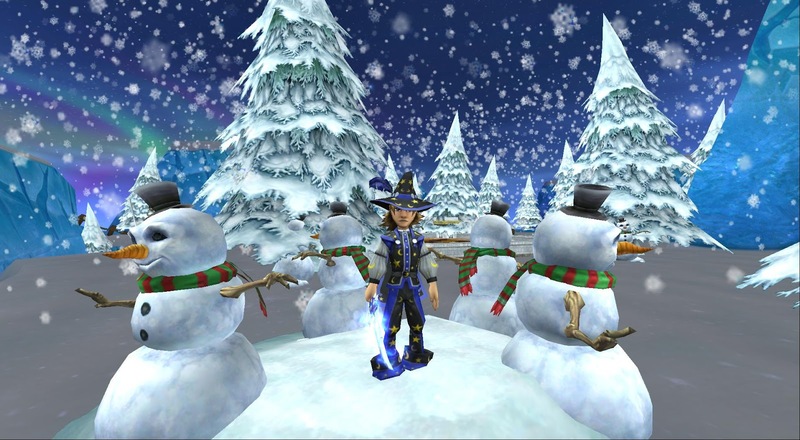 I arrived talking to many amazing community wizards, including one of the amazing hosts, Mora Misthead. When the event started, we were teleported by Mora Misthead to Cody Raventamer's beautifully decorated Polarian Shipwreck house. I think I took about 30 different screenshots of Cody's house because I always found something I loved about it. I'm sure many of you know I'm crazy about taking screenshots, but I love having these memories for later. Who knows, maybe you'll check this post a few years from now and say you remember this awesome event/house! I thought it was a beautiful house and Cody did a great job decorating. Thanks for working so hard to decorate for the event, Cody! While attending, I also got to talk with some awesome friends! This is one main thing that I love about events in the community, being able to talk to friends and being able to meet them in-game for the first time. Shortly after talking to everyone, I watched Alex Thunderstaff's stream where he streamed the tournament and gave away codes to the viewers! I didn't accept any codes, but I was wishing I could view his house in person! It's crazy, but Alex also had an amazingly decorated house. I loved the PvP ring AND the Rainbow. The music scroll in that second place he streamed really set the theme. I enjoyed the stream and thought Alex did a great job as well. I wish I could have stayed longer, but I had to leave early. 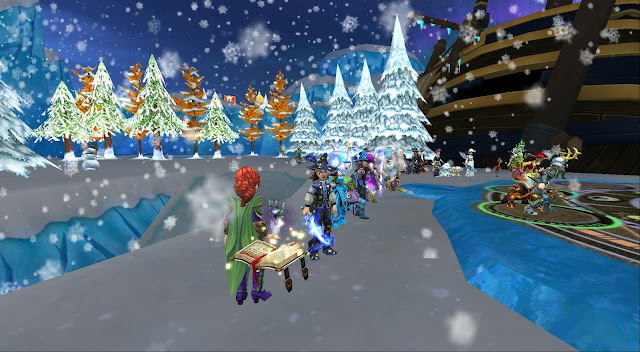 I want to thank Duelist101 for the hard work they put into bringing the community together. I enjoyed your event and can't wait to attend/watch your next one. They look nice snowmen, but are they really? It's finally October! I'm excited because the end of the year is my favorite time of year because of the Holidays. If you've read my website for awhile, you know how much I love this time of year. Recently, Halloween has become a favorite because of events that we throw in game. Speaking of that, I wanted to talk about a few things that will occur this month! Contests: We'll have plenty of contests this month. If you check my social media (Twitter, Facebook, Instagram), you'll see contests leading up to the Halloween Run. You can also check my HR Contests Page at the top of the post for contests - you'll need to continually check this page since it will be updated throughout the month. Meetups: Lately we've had meetups for those who want to help us for the Halloween Run. This will continue this month. I hope you all are able to check them out if you get a chance. We're making sure that everything runs smoothly for the event later this month.